The Titanic’s radio operators, Harold Bride and Jack Philips, were employees of a radio telegraph company named “Marconi.” Marconi’s distress call then was CQD, not SOS. CQD is still a common distress call for British ships. Morse Code Titanic Fact 2: Morse Code Operator Jack Philips Did Not Survive. The Titanic Morse Code operator Harold Bride did make it off the ship, however, Jack Philips died from exposure. This entry was posted in Morse Code Facts on 30 November 2011 by admin. It truly baffles me why people are searching the internet for Morse Code related searches. I see people searching for particular Morse Code strings ALL the time! 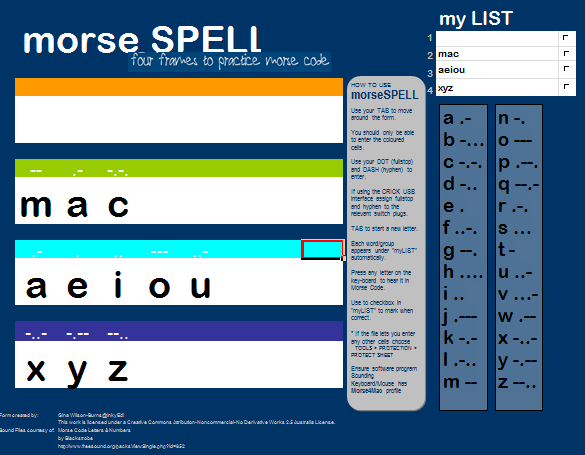 With that said, I’m going to go ahead and translate some of the most commonly typed Morse Code translations on the web. Here they are! 1. .– . / — .- .. .-.. . -. This translates to “we mailen.” What the heck does that mean? I can only assume a few things from this – either the people who type this have miss spelled something, or perhaps its a different language. Does anyone have any ideas to help me out? 2. …. . .-.. .–. / — . / .–. .-.. . .- … . Yeah, this Morse Code search query is pretty odd – and a wee bit creepy. This Morse Code string translates into, “Help Me Please.” With that said, its a little scary – are people just practicing Morse Code because they may need it in the future? I’m not entirely sure. Anyone want to chime in here? 4. …- .- .- .-. .– . .-..
Here’s another interesting one. This Morse Code string is actually translated to, “Vaarwel”, which I had no clue was even a word until now. After a quick Google search, I discovered that “Vaarwel” actually means, “Goodbye” or “Farewell.” It seems to be a dutch word. Why people are typing this via Morse Code, I’ll never know. 5. .. .- — .- .-.. .. …- . This is “I am alive” in Morse Code. Woot woot, I’m alive too!!!! 6. …. . .-.. .-.. This entry was posted in Morse Code Alphabet, Morse Code Facts and tagged top morse code searches on 02 February 2011 by admin. Morse code is a way of transmitting individual characters through a standardized pattern of dots or dashes to a listener or observer. It was developed by Samuel Finley Breese Morse (1791-1872), an American painter and inventor. Morse became particularly interested in electricity around 1872 and was from this time period that the electric telegraph was invented. Since outdated, the telegraph is a communication system that transmits electric signals over wires from location to location with the intent of communicating a message. Originally messages that needed to be delivered over great distances had to be delivered by messengers who carried them in writing or could recite them from memory. Due to the time constraints of this type of horse-driven delivery system it was no wonder Morse was successful for helping to expedite this process. In fact by 1851 the United States had over 50 telegraph companies most of which used technology that held Morse patents. Morse code was sent over a series of electrical signals referred to as dits and dahs. The short signals are referred to as dits and are represented by dots. The long signals are referred to as dahs and are represented as dashes. Morse code and its interpretation are based on defined time intervals that define characters, time between characters, and time between words. As such the speed of transmitting Morse code is measured in words per minute (WPM) just as in typing. A savvy Morse code operator is said to be able to transmit and receive information at between 20-30 WPM. Learn Morse Code. To transmit messages, operators use the electric telegraph to tap out Morse code. Because each character, letter or number, is represented by defined codes it was possible for the transmitter to send electrical impulses over wires so that a receiver could decipher them. The original machine would produce codes onto a piece of paper and then was modified to emboss the paper with dots and dashes. This entry was posted in Morse Code Facts on 12 December 2010 by admin. Contrary to popular belief, the Morse code for symbol for SOS (. . . – – – . . .) is not an abbreviation or acronym for “save our ship,” “save our souls,” or “send out succour.” The code above was originally intended solely as a signal for distress and was first adopted by the German government in radio regulations in 1905. It soon became the global standard after the second International Radiotelegraphic Convention signed in 1906. The SOS distress signal remained the maritime signal up until recently when in 1999 it was replaced by the Global Maritime Distress Safety System, an international set of safety procedures. Learn Morse code! The Germans never intended on naming the distress signal SOS, the codes makeup was just a simple way to transmit the signal and was easy to remember. It is easy to see why the code was translated into the popular terms mentioned above and how people confuse it for what it really is. One of the original distress signals used was “QCD” and was used by Marconi International Marine Communication Company. This code stood to mean “all stations, distress” and has also been commonly misinterpreted to mean “come quick, danger,” “come quickly, distress,” or “come quick- drowning!” The signal was used by Marconi operators but was never adopted by international standards because it could be mistaken for simply “CQ” or “general call” if the reception was poor. It wasn’t until 1912 and the sinking of the Titanic when the ship’s Marconi operators used both QCD and SOS distress signals to try and get help. Because of this ill-ending story and inconsistency amongst ship operators the use of the CQD has died out. SOS as a distress call has always been transmitted as a continuous sequence of dits-and-dahs without the spacing that goes between letters in traditional transmissions. The term was regarded as safe for use as long as the Morse code operators were aware that it was just a convenient way for them to remember the distress signal and not transmit it in the literal sense. Eventually SOS was written with a bar over it to designate that it was to be transmitted continuously and without internal spaces. Another notable characteristic of the signal is that it can be used visually as well. It can be used in three short flashes, three long, then three short to signal distress visually as well as spelled out so that it can be viewed from above perhaps by a rescue plane or chopper. The neat thing about SOS is that it is readable upside down as well as right-side-up from above. This entry was posted in Morse Code Facts on 20 September 2009 by admin.